Are looking for the best places to donate clothes in Indianapolis? Awesome. 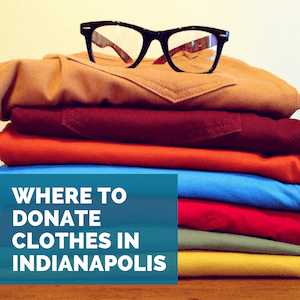 We’ve done the research and compiled a list of the most beneficial places to donate clothes in Indianapolis. Also, if you have suggestions of charities to add to the list. We’d love to hear from you! Just comment below or contact us, and we’ll add your suggestion. Lambswear – This amazing local organization provides children’s clothing size Preemie – Y14/16 to all families with no requirements or qualifications. They need gently used or new shirts, pants, shoes, pajamas, and outwear. And they need new socks and underwear. Learn more about how you can help Lambswear here. Children’s Bureau Inc. – The Children’s Bureau collects new and gently used children’s clothing for families across the state. The Children’s Bureau also needs uniforms, so that kids can get the right start for school. Learn more about what the Children’s Bureau needs here. Life Centers- New and gently used baby and maternity clothing are needed and accepted at all 8 Indianapolis area Life Center locations. Learn more about their urgent needs here. Wheeler Mission – Wheeler mission accepts new and gently used women’s, men’s, and children’s clothing and outwear. They also need new socks and underwear for men, women, and children. Learn more about Wheeler Mission’s urgent needs here. Julian Center – The Julian Center needs gently used clothes, home goods, and furniture to help abuse survivors in the Indianapolis area. Click here to learn more about what Julian Center takes and where to drop off donations. AMVETS of Indianapolis – Clothing donations are AMVETS of Indianapolis number priority. The organization accepts used men’s, women’s, and children’s clothing. Learn more about what AMVETS takes here. Goodwill Indy – Goodwill doesn’t just sell donated clothing. Actually, many local Indianapolis charities and shelters depend on Goodwill vouchers to give people in need. This is because many shelters and charities do not have the storage or resources to accept donations. So, individuals and families in need are given vouchers to use at Goodwill. Dress for Success Indy – Accepts new and gently used women’s professional clothing. Think about what a woman would need to wear for a job interview, and that’s what they need. Men’s clothes and denim can’t be accepted. Learn more about Dress for Success’s needs here. Visit St. Vincent de Paul’s Mission 27 Resale to learn more about how clothing donations help those in need in Indianapolis. Finally finally (haha! ), we hope this list of where to donate clothes in Indianapolis is helpful. Our goal is to do the research, so that you can find the best charity to donate your clothing to. Thank you for your interest in helping others, and take care!